During the week I made a start on my first quilt top. Under the watchful eye of a craft buddy I learnt to how cut my squares properly. I duly noted the exacting methods - the right angles, the straight lines and the precise measurements. Of course as soon as she had left the premises, I started taking liberties. (Warning: real quilters are advised to turn away now.) I stacked piles of fabric up and frantically sawed through their ample layers with my rotary cutter. Predictably there were casualties. But it was all for the greater good. More squares; less time. See? All good. 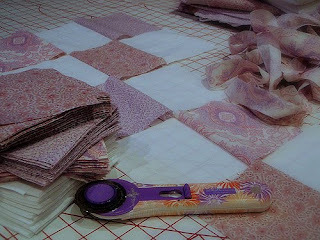 So, this week I am going to begin piecing together the quilt top (with a selection of less-than-squared squares). Oh hang on, it appears I already have. It seems there has been a bit of sewing prior to the finish of the cutting. Just a teensy bit (... but I think I got away with it). OK, I admit I did get a tad impatient with all those squares and wandered off to the sewing machine in the middle of it all. Talk about attention deficit craft. Lovely fabrics Liesl, I think your quilt will be beautiful. I am, however, a teensy bit concerned that the tone of your post may give people the (very wrong!) impression that I am a 'real quilter'. Just so you know, NOTHING could be further from the truth!! Hooray for crafty skill share I say. What fun. Looking good..I am a very impatient sewer too. I'm a little scared to start mine. The pile is sitting there, but I'm sure I will do so many things a true quilty pro would tut tut. Ah well. Yours will look just lovely. Those fabrics are very pretty! Ha Ha!! I'm with you on the impatience thing!! Good luck with it all! Your such a great student. I like all those squares though, thats my favourite pattern for a quilt, that and hexagons. I loved your little warning to serious quilters...my mum would be squealing if she read it but I think my mehtod and yours must be very similar. Who has time to cut stuff out properly anyway. I'm with you! All adds to the charm of the thing I think! Cutting, zzzz. Piecing, zzzz. Basting, ZZZZZZZZ!!! Quilting, ok. Finished product - worth it! I take my hat off to you that you are having a crack which looks quite difficult and something I would avoid (as I have no sewing talent...yet!). Love the colours - it looks like its coming along nicely and with the pictures you have shown, you can't see the casualties! hee hee short cuts are great!! I'm certainly no quilter but I would hazard a guess that its important to stay interested in the project and get through the tedious bits any way you can. it looks great lined up like that! Sounds like fun. You sound like my kind of crafter- straight to the point and a little loose around the edges. I have never been one for straight lines... no patience. Wish I had a little more though. xo m.
Ha ha you've crossed over to the dark side! way too funny ... i think that's what's putting me off. i'm bad enough wanting things to be just so without having to have everything perfect. it's beyond obsessive. Haha...I totally understand getting impatient and wanting to cut through too many layers at a time, although for me it's usually paper! I find that in the end I just can never cut straight! I've learned to love the imperfections, because if you look closely everything is like that...it's life! Lovely start of quilt...I totally wish I knew how to sew! Keep going so we can see it in all its glory!! !